We have gone on a tour of our kitchen and pantry and now it is time to show you our living room. Our living room and kitchen are actually one open space, but they do have their own feel. 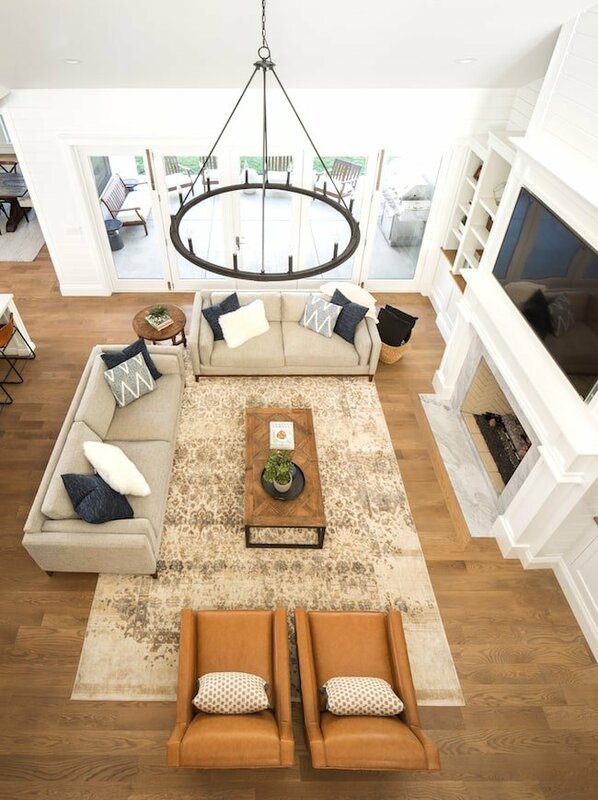 We love the open concept design and wanted to have a big open space for entertaining. Come on into our living room and we will show you around! When you walk in our front door, you walk right into the living room and kitchen area. When we were designing the house I told our builder Tom, from The Fox Group, that I wanted shiplap in the staircase. 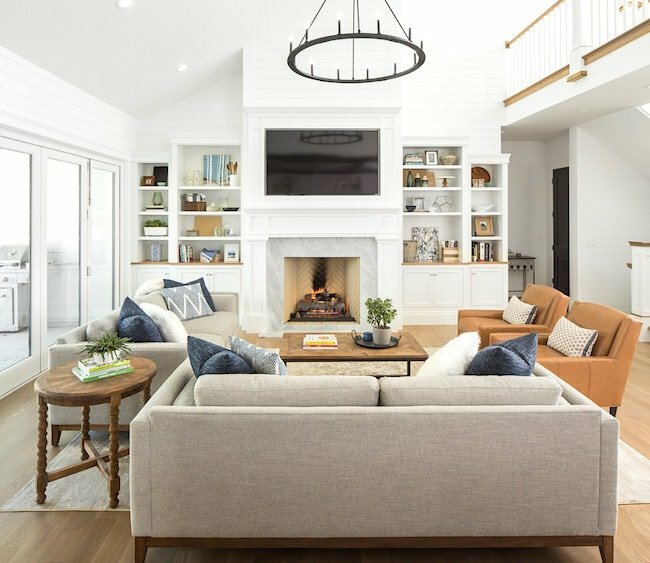 He loved it and went for it…and then he continued the white shiplap throughout the entire living room. Best decision ever. We LOVE it. 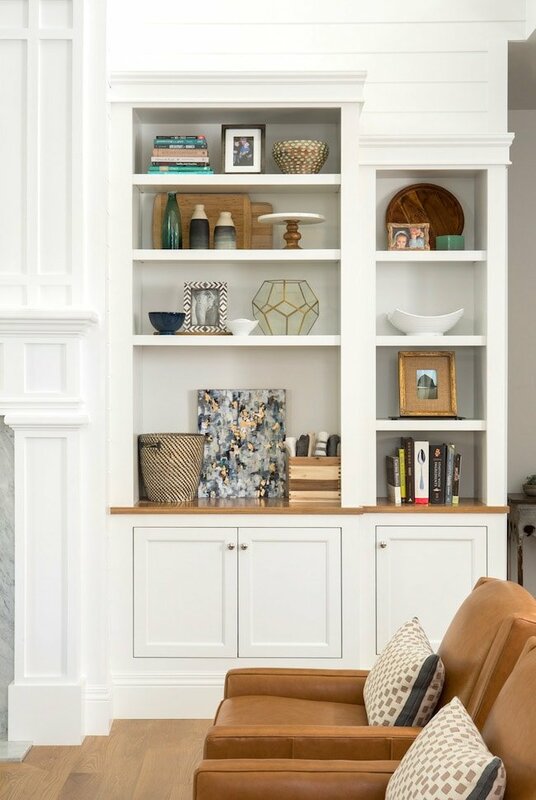 It is amazing what a little shiplap will do to a room. All of our walls and shiplap are Bright White by Sherwin-Williams. Here is a look from the upstairs! I looked for a rug for this space for a LONG time. When I heard that Loloi Rugs teamed up with Magnolia Home and Joanna Gaines, I knew I had to check out their rugs. You all know I am a huge Joanna fan, who isn’t, right? 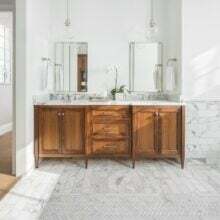 I immediately fell in love with the Kivi Ivory Quarry Rug. It is SO pretty and perfect for the living room space. On the east side of the living room, we have a wall of Pella windows and doors that open up into our outdoor covered patio. We love being able to open up all of the windows to create an indoor and outdoor entertaining space. Here is the view from the patio. We love opening up the doors for parties, BBQ’s, or just to let the boys play outside. We love the fresh air. This is the view from the kitchen. I knew we had a lot of built in cabinets, but I didn’t really realize it until I had to decorate them. Luckily, I had some friends help me. One of my friends, Leslie, even painted me two beautiful paintings to help fill the space. I love them! To decorate, we used cookbooks, cutting boards, and other random things I already had and then we went shopping at World Market to fill in the gaps. Thanks for taking a tour of our living room. We love cozying up to the fire, watching football, and snuggling with the boys. This room really makes our house feel like a home. Read more about our home here. Disclosure-this post contains some affiliate links. Thank you to the brands that partnered with us on our living room: Loloi Rugs, Magnolia Home, Room & Board, Wayfair, Sherwin-Williams, World Market, Lighting Design, and Joss & Main. Photos by Scott Davis. Beautiful, Maria! Straight out of a magazine 😀 You did a wonderful job decorating. Thanks so much! It has been fun. Very beautiful. I love the wall of doors that opens up. Thanks! That is one of our favorite features of our new home. Beautiful! Can you share what your wood flooring is? It is white oak and stained weathered oak color. Absolutely beautiful! I wouldn’t be surprised if I found this article in HGTV or something, your home is very well put together. Thank you so much for sharing! What a beautiful room to draw inspiration from. It’s great to hear about where you purchased items from. 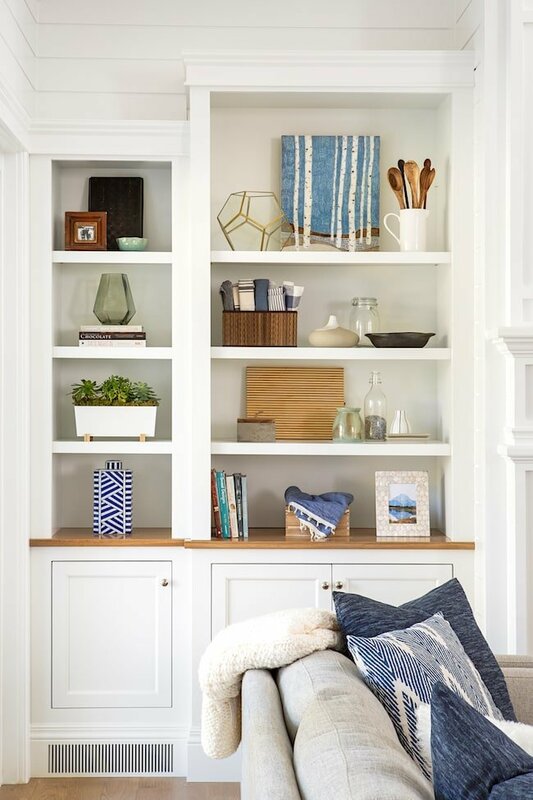 I always learn about a few new places to look for home decor from your posts! Glad you found some new places to shop! What marvelous spaces and design – wonderful choices for the furniture and decorating! Thanks so much. It has been a fun process. so tasteful. lovely and elegant. Your floors are divine! I do love your living room – it’s so well organized and decorated. 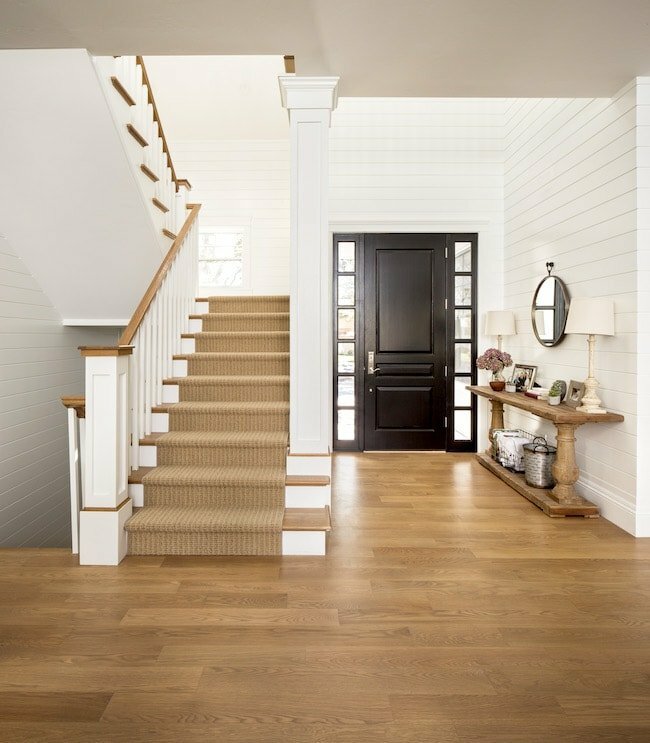 The carpet is absolutely gorgeous and I absolutely agree on the shiplap. Gorgeous, gorgeous, gorgeous! I love your home Maria! Lovely Maria- you must be so happy! We are loving it. Thanks Heather! Beautiful like your kitchen and pantry. Love it! Thank you for sharing. P.S. Every single recipe I have ever made of yours has been a home run….but I have to say my most favorite is the Brown Butter Salted Caramel Snickerdoodles! Thanks so much! And I am glad you like those cookies, they are my favorite too! Your space is beautiful! I have a quick question about the doors that fully open to the outdoor space as we were thinking of doing something similar. Do you not have bugs in Utah? Because we have lots in Virginia and I can’t figure out how open doors would work with that issue! I do love the look. Hi Kim-we do have bugs in Utah, but they really aren’t that bad. We notice a few more flies when we have them open, but not too bad. We eventually want to put a drop down screen off the covered patio. Thank you !! This was so fun. You have good taste and are a very good house keeper honey ! May God bless you with a hunger for His holy word ! hey girl love the living room! SO pretty! Thanks for sharing, just beautiful. Hi Gail-thanks for your comment. We hope to teach some cooking and baking classes soon. I hope all is well! Beautiful living room, looks awesome! your house if gorgeous!!!! WOW, beautiful. . and loved the way you decorated everything! Dream house! Love your style! Thanks for the tour. Regarding your TV, where are you hiding all the components such as the cable box, DVD player, sound controls/speakers and such? We are about to do a similar design and can’t figure out a good way to hide the components and especially our Bose subwoofer. Absolutely beautiful, Maria! Love the large open space and all the light. It looks so inviting! Gosh, your home is simply breathtaking. 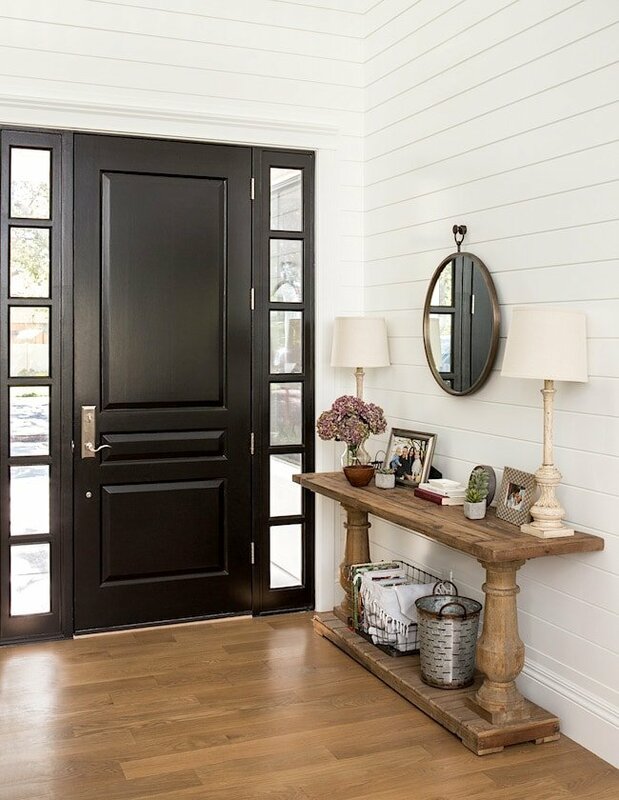 I have serious shiplap envy. It looks perfect in the space. I have two question. First, with two active little boys, how on earth do you keep everything looking so perfect? I imagine Caleb and Maxwell love sliding in their socks on those lovely floors! Second, I love the look of the Pella patio doors but what about bugs? Every time I see doors that expand open but have no screens, I think of all this little creepy, flying things that could come pouring in both during the day and especially in the evening. I am sure you have bugs in Utah so I am curious as to how you deal with the problem. Thank you! Our house is pretty easy to keep clean now that everything has a place. The boys have a toy cabinet downstairs and they get them out to play and then put them away. We also have a rule of no eating in the living room. They do love running around in circles. It is fun! We don’t leave the doors open all day, just when entertaining or when we are outside. We will get some flies in the house, but nothing too bad. We will eventually put a screen on the outside of the patio. Great job Maria and Josh! Want to see it in person. Congratulations. Looks comfortable and sophisticated at the same time. Such a gorgeous space! I love all the clean lines! Your home is so very lovely!! You should be so proud!! Stunning home! I hope you will share more. I am especially interested in seeing how you decorated the boys’ room. What a beautiful home! Love how when you walk in the front door you can’t see the stairs. 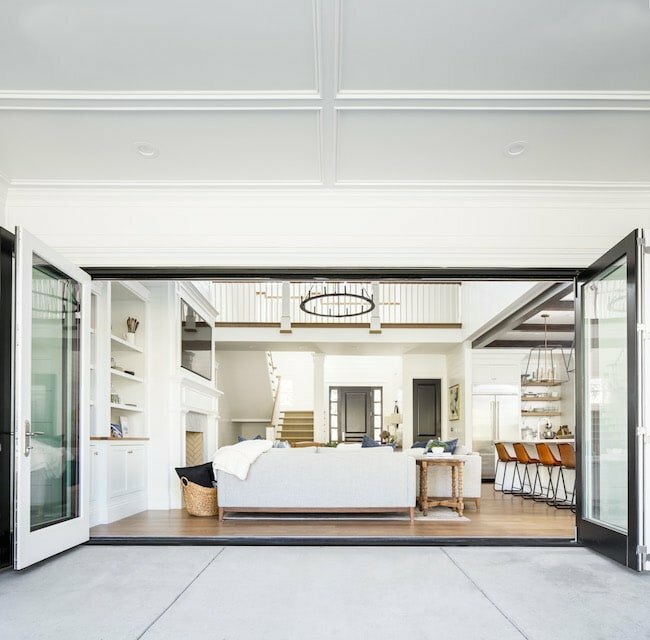 Also love how the doors open to the patio so the whole house is open! Very nice! Thank you for sharing!! 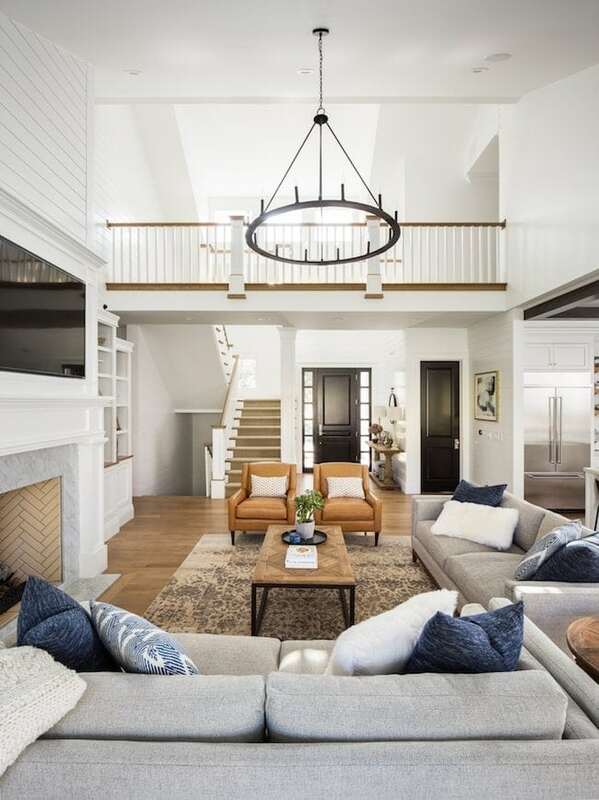 This living room is such an inspiring space! How comfortable at the couches in your opinion? Really interested in getting those! Yes, we all love the couches! Beautiful! Where did you purchase your leather chairs and rug? Where did you purchase the chairs? You have a beautiful home. 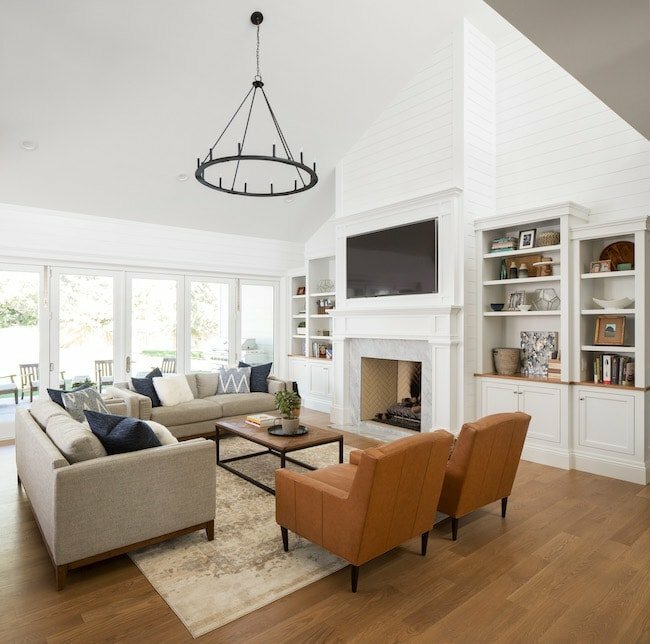 I am currently remodeling my family room and I keep coming back to your home for inspiration. Would you be comfortable sharing where you purchased your leather chairs and the color of leather you picked. Again, beautiful taste. The chairs are linked in the post. They are from Room and Board. I love your living room rug! I have been searching for one for a LONG time! This looks it might be a fit for me!! Are you still happy with the quality and wear? Yes, we still love it! Can you please tell me where you got your circular metal/iron 12 light chandelier from in the living room? I’m redoing my living room and need to replace the chandelier and this is the style I’m wanting. I like this particular one better than some of the others I’ve seen on Pinterest! The light is linked in the post! Hi – I am absolutely in love with your home. Great ideas (two fridges in house, not in the garage, a water fountain!!) you’ve incorporated here! I noticed that your stairway is open to up AND down. Up, I am sure are bedrooms. Curious what you’ve done w downstairs, especially since you have an open stairway. Any chance you’ll be sharing that space as well? Thanks for the tour. Love your style! 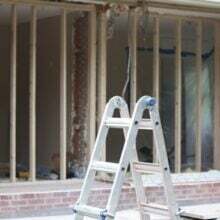 Your home is absolutely amazing and very inspiring to me during our remodel. Do you happen to know the finish used on your concrete patio? Gorgeous! what rug size did you get? Thanks! An open fireplace in a white living room is not a really well thought out idea given that you want to use it for something except letting the dog sleep there. Otherwise very pretty! 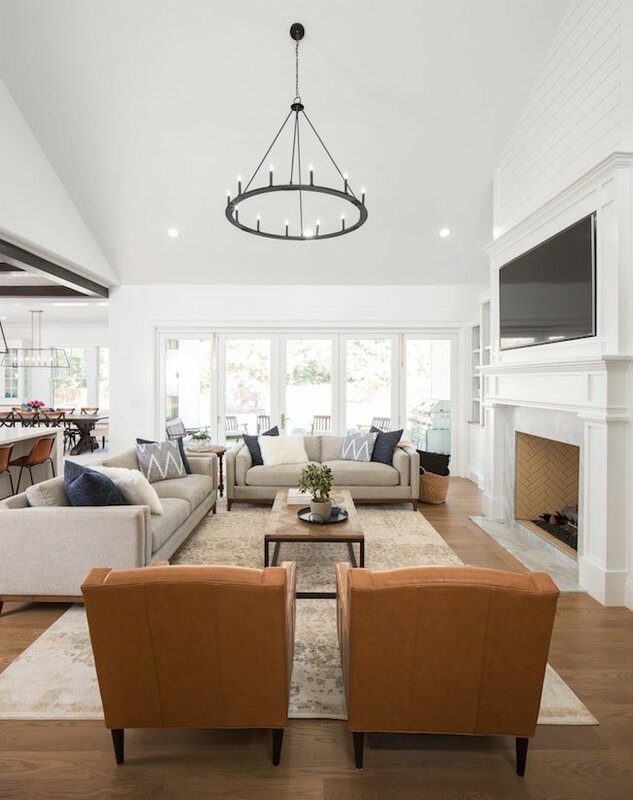 This living room is amazing, it’s a little luxurious with a touch of simplicity and neutral colors..
I’m very interested in getting the same couches! How are they holding up? In the reviews, some people mentioned that the back cushions start to sag, and that the fabric pills. Have you noticed any of that? Also, are they easy to keep clean? I have 5 young children and need something that can be easily wiped down! Thank you so so much! We are still loving the couches. And they are easy to clean. You can also buy the warranty where they will come clean your couches. Hi there! After a few years what do you think of the functionality of the folding doors in the living room with little kids? We are building a new home and planning to put them in as well but I’m trying to ensure it’s functional for daily life with toddlers. Thanks for your input! Hello! We are building a house with a very similar layout and to say I’m obsessed with your house is an understatement. I would be so so grateful if you could answer a few questions I had about your home. How large is the windows/doors in the living room and how large is your covered deck attached to it. My biggest fear is losing natural light in the living space due to the covered porch. It doesn’t look like this happened with you guys. Also, how tall are your living room ceilings? Thank you oh so much! Beautiful, thank you for posting. Helps me trying to design my living room. Can you please tell me if that rug is 8×10 or bigger? It is a 12×15 but it comes in several sizes.